The field for the first-ever Camping World Truck Series Chase was set on Friday at Chicagoland Speedway but it was Sprint Cup regular Kyle Busch who won the race at the Joliet 1.5-mile oval. Daniel Hemric finished second and he and Timothy Peters locked up the final two of eight spots in the inaugural trucks Chase, which starts Sept. 24 at New Hampshire Motor Speedway. Busch led 95 of the 151 laps in winning for the second time in four starts this season, the fifth time at Chicagoland and the 46th time in his career. Two of Busch’s Kyle Busch Motorsports drivers, William Byron and Christopher Bell, already had qualified for the first Chase on the strength of regular-season victories. The top seed in the Chase with five wins as a rookie, Byron had a tough night on Friday, getting loose underneath Ben Rhodes on Lap 3 and slamming the outside wall in Turn 2. Byron finished 30th, but the low finish had no effect on his Chase standing with the reset of points after the race. “It was really important, too, to see the 9 (Byron) and the 4 (Bell) make the Chase this year for KBM,” Busch said. “They’ve got two opportunities there to go for the championship. And then the 13 (Hayley) there at the end, that’s a brand new truck out of our KBM stable. In fact, Hayley though he had the fastest truck but fell victim to Busch’s vast experience in the series. Byron characterized his early accident as a learning experience. “It was learning what not to do for the Chase,” he said. The eight Chase drivers in order of seeding are Byron, two-time champion Matt Crafton, John Hunter Nemechek, Bell, Johnny Sauter, Ben Kennedy, Hemric and Peters. 1. 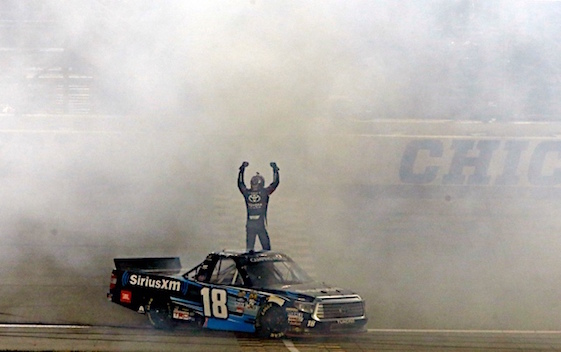 (8) Kyle Busch(i), Toyota, 151. 2. (10) Daniel Hemric, Ford, 151. 3. (20) Cameron Hayley, Toyota, 151. 4. (12) Christopher Bell #, Toyota, 151. 5. (16) Johnny Sauter, Chevrolet, 151. 6. (14) Grant Enfinger #, Chevrolet, 151. 7. (1) Spencer Gallagher, Chevrolet, 151. 8. (5) Timothy Peters, Toyota, 151. 9. (17) Cole Custer #, Chevrolet, 151. 10. (4) Tyler Reddick, Ford, 151. 11. (3) Daniel Suarez(i), Toyota, 151. 12. (11) Matt Tifft #, Toyota, 151. 13. (22) Josh Berry(i), Chevrolet, 151. 14. (18) John H Nemechek, Chevrolet, 151. 15. (21) Ryan Truex, Toyota, 151. 16. (19) Tyler Young, Chevrolet, 151. 17. (26) Austin Wayne Self #, Toyota, 151. 18. (25) Ray Black Jr(i), Chevrolet, 151. 19. (15) Rico Abreu #, Toyota, 150. 20. (2) John Wes Townley, Chevrolet, 149. 21. (30) Travis Kvapil, Chevrolet, Engine, 147. 22. (27) Jennifer Jo Cobb, Chevrolet, 147. 23. (23) Jordan Anderson, Chevrolet, Engine, 138. 24. (24) Tommy Joe Martins, Chevrolet, Accident, 137. 25. (7) Ben Rhodes #, Toyota, Accident, 125. 26. (6) Ben Kennedy, Chevrolet, Accident, 111. 27. (13) Matt Crafton, Toyota, Accident, 111. 28. (29) Reed Sorenson(i), Chevrolet, Clutch, 91. 29. (28) Jesse Little, Chevrolet, Engine, 79. 30. (9) William Byron #, Toyota, Accident, 40. 31. (32) Norm Benning, Chevrolet, Suspension, 14. 32. (31) Caleb Roark, Chevrolet, Electrical, 11. Average Speed of Race Winner: 108.648 mph. Time of Race: 02 Hrs, 05 Mins, 05 Secs. Margin of Victory: Caution. Caution Flags: 10 for 41 laps. Lead Changes: 10 among 5 drivers. Lap Leaders: S. Gallagher 1-8; K. Busch(i) 9-11; D. Suarez(i) 12-47; T. Martins 48; K. Busch(i) 49-106; B. Kennedy 107-109; D. Suarez(i) 110; B. Kennedy 111; K. Busch(i) 112-117; D. Suarez(i) 118-123; K. Busch(i) 124-151. Leaders Summary (Driver, Times Lead, Laps Led): K. Busch(i) 4 times for 95 laps; D. Suarez(i) 3 times for 43 laps; S. Gallagher 1 time for 8 laps; B. Kennedy 2 times for 4 laps; T. Martins 1 time for 1 lap. Top 10 in Points: W. Byron # – 405; D. Hemric – 405; J. Sauter – 384; T. Peters – 375; C. Bell # – 362; M. Crafton – 358; J. Nemechek – 343; B. Kennedy – 342; C. Hayley – 342; C. Custer # – 342.